SYNCADD makes it easy for our clients to get what they need, when they need it. These are the fundamentals upon which SYNCADD has built our business and earned a value-based relationship with our clients. 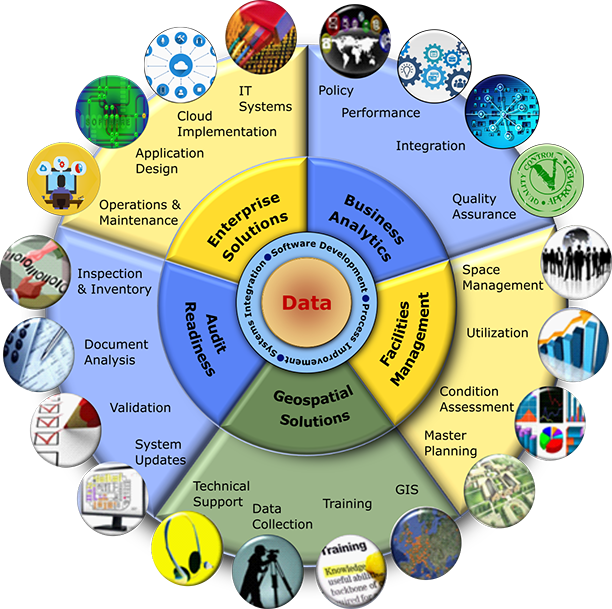 Our work has enabled decision-making through higher quality facilities management and space utilization analytics, moved organizations from disparate database environments to robust enterprise systems, and empowered organizations through high quality geospatial data and solutions since 1998. It was the strength of our data accuracy and drive for informed decision-making tools that led to SYNCADD’s development of the enterprise Pro-active Real Property Interactive Space Management System (ePRISMS), the cloud-based strategic space management tool, maximizing U.S. Army resource utilization worldwide. 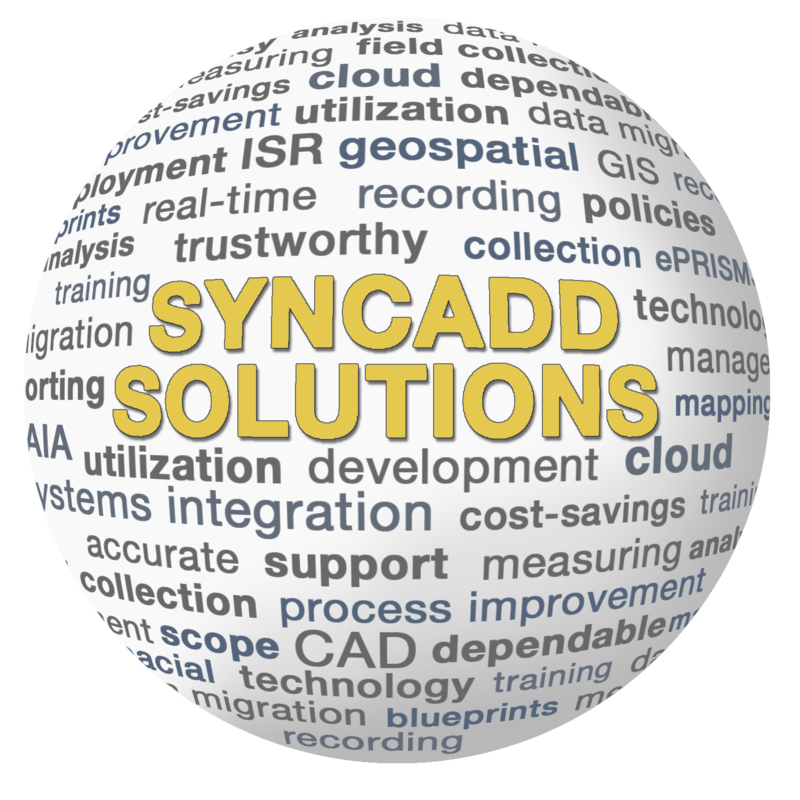 SYNCADD is a technology solutions company focused on space management, business systems integration, geospatial solutions, and real property utilization solutions. Our customers view us as a trusted partner that enables premium outcomes which exceed their expectations. Our work integrates cutting-edge technology, innovative processes, and well-managed databases to create solutions that deliver highly desired business outcomes. SYNCADD was founded as a CADD services company. SYNCADD was awarded the first PRISMS (Pro-Active Real Property Interactive Space Management System) contract with the US Army’s Pacific Region. SYNCADD was awarded the Office of the Assistant Chief of Staff for Installation Management (OACSIM), Headquarters, Department of the Army (HQDA) Installation Geospatial Information & Services (IGI&S) Support Contract. SYNCADD opened its Washington D.C. office. SYNCADD was awarded the Installation Status Report (ISR) contract and has been supporting HQDA ever since. OACSIM designated PRISMS as the Army’s Real Property Utilization System. Enterprise PRISMS (ePRISMS) selected as one of five DoD business systems to participate in a pilot project as the first commercial cloud implementation for DoD business sensitive systems. Army Memo was signed stipulating enterprise PRISMS (ePRISMS) is the Army’ Enterprise solution for space utilization management and no other space utilization management systems are authorized without HQDA approval. Sigma Planning Group, Inc. merged with SYNCADD offering solid real property master planning capabilities to customers and completing SYNCADD’s ability to fulfill all components of the Real Property Management Lifecycle. SYNCADD opened its San Antonio, TX and Daleville, VA offices. SYNCADD successfully migrated ePRISMS and AIA into the cloud, two of the first systems within DoD. SYNCADD supported several installations with complete real property lifecycle support from physical inventories to CFOA audit readiness and IMCOM OPORD 19-009 compliance.